Add WordPress Email Subscription With Moz Effect To Blog! Gathering our readers email address is so important now days. It has become a flag ship move for most of the pro bloggers and indeed it works solid. Imagine you work hard for 5 years to gain attention from search engines to send in traffic to your blog. You managed thousands of visitors per day until Google decided to change their algorithms. As a results your blog gets hit and your traffic drops to ground. What then? Would you jump of the mountain or hit your head with the wall? You cant do any thing. So to avoid any such disastrous situation, pro bloggers encourage webmasters to gather their readers/visitors email addresses so that they could keep track of them and to insure that they are still in tact with the blog even if it gets hurt via search engines. So lets add this cool widget to our blogger blogs. Go to Blogger Design >> Edit HTML and tick the check box. Once you have found the above code (that refers to the area right after the post body), well need to add the following code just below it. Thats all! Now hit Save Template. Now simply edit the parts highlighted, the orange one indicates paragraph, heading. The red one is your FeedBurner ID that you have to change. Hope you liked the widget. Share your love for the widget below in the comment section. 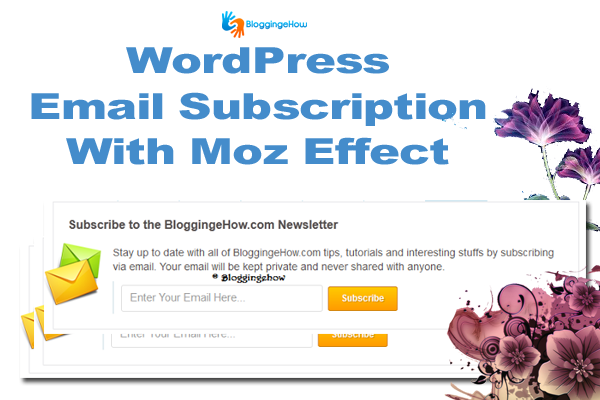 BloggingeHow | Making Blogging Simpler: Add WordPress Email Subscription With Moz Effect To Blog!